Listening to your favourite songs in the bathroom at great sound quality has never been an easy task. There are many ways you could make it work, but it is clear some are more effective than others. 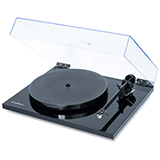 The option we recommend, however, may not be what you expect, and it's still affordable - and most importantly, sounds fantastic. Bluetooth shower speakers provide value for money, however sometimes lack the depth of sound necessary to even cover the noise of the shower or bath running! They also require charging or replacing batteries often, and this is something that can get tiresome over time. The wet nature of the environment also makes it difficult and awkward to control such as changing tracks or increasing volume. It is clear a more permanent solution is required to make listening to music in your bathroom worth it. 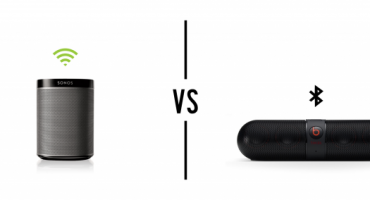 What makes a great bathroom speaker? One of the most important, if not THE most important, feature of a bathroom speaker is simple hands-free control. Whether you're showering or bathing, it's never ideal to touch a stereo system or smartphone with wet hands for risk of dropping it in water- a near-certain death for your phone. This is where integrated voice control reaches a new level. Nothing is worse than having to fumble around the bathroom reaching for your phone, just to change track or up the volume. And the number 1 limitation with the most popular voice-assisted speakers such as the Amazon Echo and Google Home is the sound quality and bass of the unit. Of course, the speaker must also be moisture and steam resistant otherwise you risk seriously damaging its internal components. 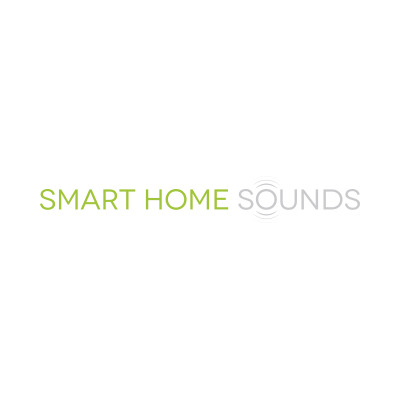 When you combine all of these factors, we believe this is the best possible music listening scenario for a bathroom, and Smart Home Sounds has the solution. The Sonos One is one of the most feature-packed but easy-to-use smart speakers on the market and above all this, sounds fantastic. Its open voice platform allows for multiple voice assistants to be added in the future (Google Assistant to be added soon). This will eventually give customers the choice of voice assistant, something that has never been done before with any smart speaker. 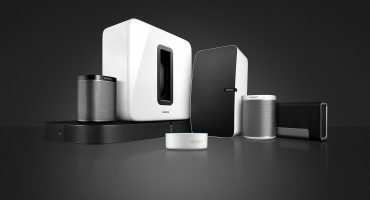 Currently Amazon Alexa is built-in to the unit and combined with Sonos' heritage sound quality, it's got all of the same functionality as the Amazon Echo but with a sound quality that is in a different league to the rest. With a wall mount from Flexson you can easily mount your Sonos One to the wall up high, out of reach and then easily ask Alexa to play any song, artist, playlist, radio station or audiobook completely hands-free and wirelessly. Want to turn up your favourite sing-along song in the shower? Simply say “Alexa, turn it up” - full, flexible music control with no need to touch any devices whatsoever. The Sonos One is also made to be steam, moisture and humidity resistant, so it is more than happy in this kind of environment. Just don't place it inside the shower enclosure or over the bath tub, as it is not designed to get wet or splashed. Its compact size will also mean it won't look awkward or out of place as other larger audio equipment may suffer from in your bathroom. Another great benefit of the Sonos One is that if you have any Sonos speakers already, you can add the Sonos One to the same audio ecosystem. 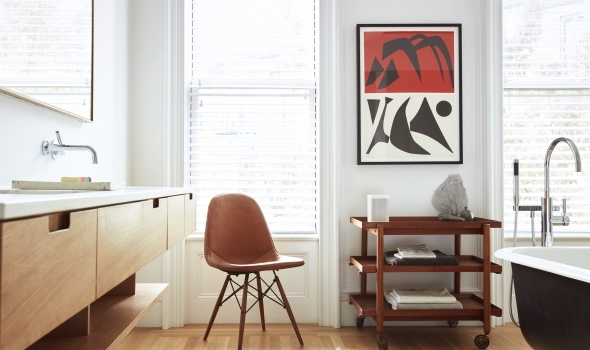 That means you can group music to or from other Sonos speakers in your home wirelessly. Another bonus with the Sonos system is if you already have a Beam, PLAYBAR or PLAYBASE in your system you can send your TV audio straight to your bathroom Sonos One, so you never have to miss out on that all important football match or news update. What's more? Airplay 2 is integrated with Sonos, opening up your audio options even more. Using your Apple device, listen to any audio that the device is playing. This makes listening to YouTube videos possible, a long-awaited Sonos feature by fans. Can I use Ceiling Speakers in the Bathroom? If you're truly serious about a permanent audio solution in your bathroom, installing a ceiling speaker with a Sonos Amp offers the most aesthetic solution while still maintaining a great listening experience in the bathroom. 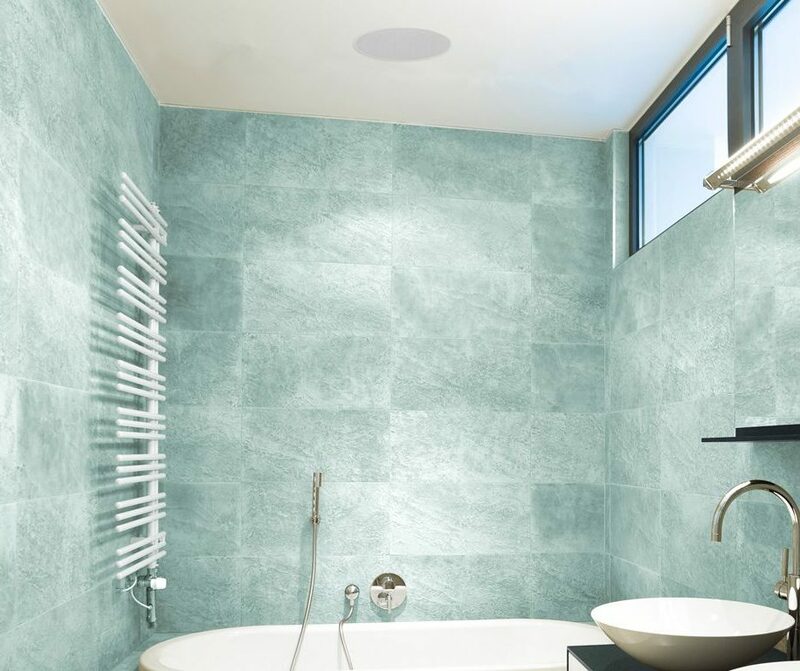 With a speaker being installed flush into the ceiling, no wall or shelf space is taken up, and most ceiling speakers are fully steam and moisture resistant - both attributes of particular importance in a bathroom. Controlling your music and volume is dealt with using the award-winning Sonos app available for free on all app stores. 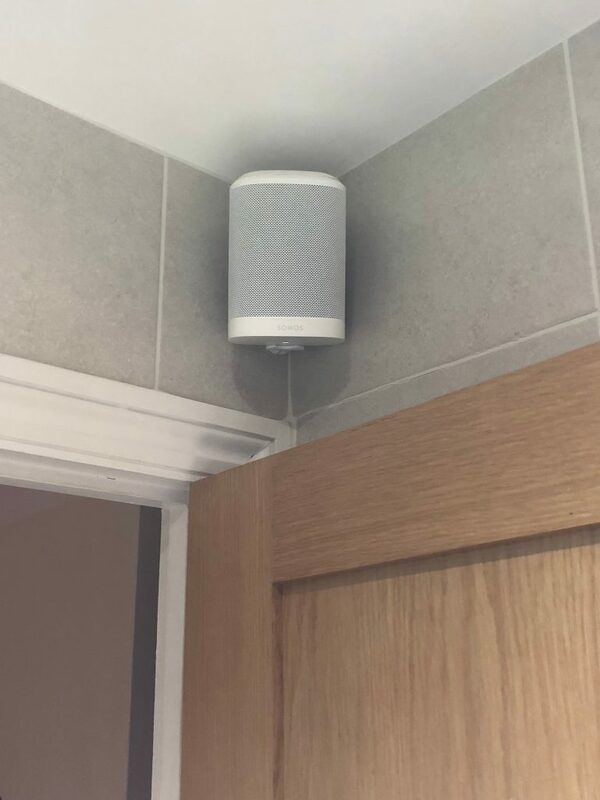 Going hands-free (to the same effect as the Sonos One) is achieved easily by adding an Amazon Echo device in the bathroom. For a small bathroom, we'd recommend using a single stereo speaker such as the Monitor Audio C180-T2 which can output a nice stereo sound by using just one ceiling speaker. 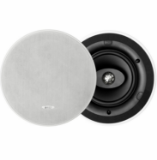 If you have space for a pair of ceiling speakers, this will offer a superior stereo experience over a single stereo speaker, due to receiving an independent left and right channel of sound. Our Sonance ceiling speaker bundle with a Sonos Amp is our best value ceiling speaker package, ideal for bathrooms. If you need the ceiling speaker to be fully waterproof, consider the Monitor Audio AWC265-T2 (single stereo) which is fully IP rated. That means it can go in wet rooms, in a shower enclosure, above a bath tub or even in a sauna! The speaker will be hard-wired to the Sonos Amp via speaker cable which provides power to the speaker. 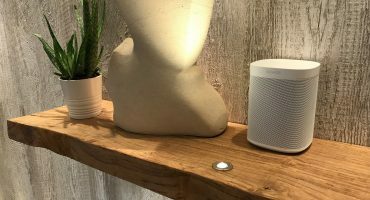 The Amp can be stored in a separate storage location in a nearby room and just requires mains power and will connect directly to your home WiFi connection, just like the Sonos One. Although wiring behind the walls/ceilings can be a DIY job, we recommend choosing an electrician to complete the installation if you have no experience with cabling. If you'd like to find out more about using ceiling speakers with Sonos Amps, have a read about choosing the perfect ceiling speaker for you. If you're looking for a long-term bathroom audio solution that sounds great but do not want to pay the odds for it, Sonos offers an exceptional experience, both in the sound quality and usability department. 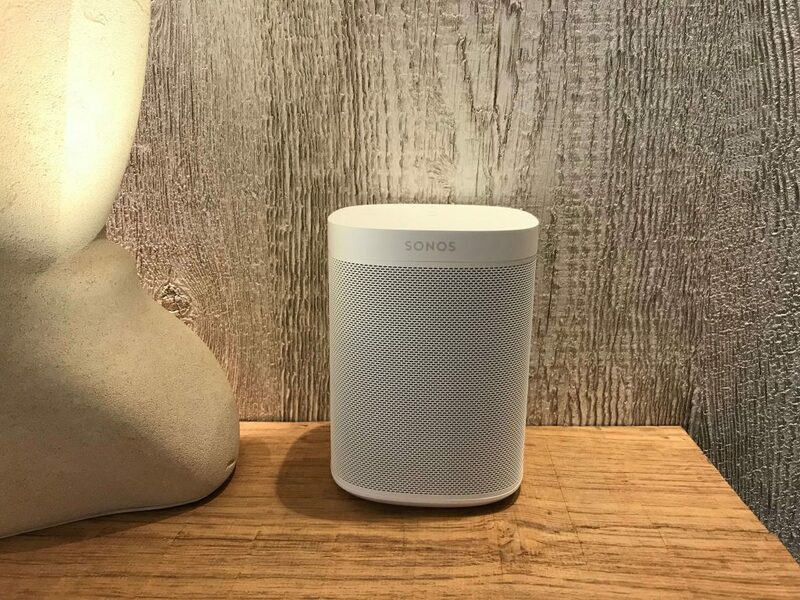 Whether it's the Sonos One or a ceiling speaker powered by Sonos you go for, you will gain access to over 56 music streaming services, thousands of radio stations, audiobooks and a growing list of features, that can all be streamed to your speaker wirelessly and hands-free. If you love Alexa but want something that pumps out great sound in your bathroom, we believe Sonos is the smart choice. For friendly advice about what solution would be best for your bathroom, speak to one of our specialists today. Please make sure you are conforming to UK Electrical regulations regarding power use in the bathroom. Do not use a shaver socket or extractor fan as a means to power the Sonos. If you are unsure, please ask your electrician for advice. 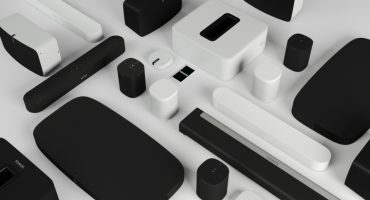 Looking to Purchase a Sonos One?